Dr. Elias Torres Alonso, Research Scientist at Graphenea and former PhD student in Professor Craciun's team at Exeter, added: "This new research opens up the gateway for smart textiles to play a pivotal role in so many fields in the not-too-distant future. By weaving the graphene fibers into the fabric, we have created a new technique to all the full integration of electronics into textiles. The only limits from now are really within our own imagination." 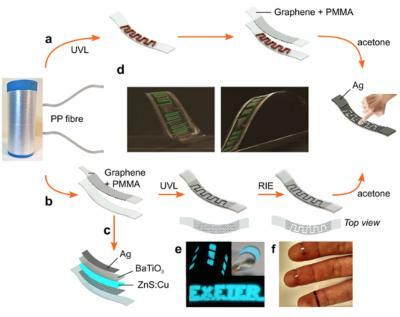 This new research used existing polypropylene fibers - typically used in a host of commercial applications in the textile industry - to attach the new, graphene-based electronic fibers to create touch-sensor and light-emitting devices. Professor Saverio Russo, co-author of this study and researcher at the University of Exeter's Physics department, added: "The incorporation of electronic devices on fabrics is something that scientists have tried to produce for a number of years, and is a truly game-changing advancement for modern technology." Dr Ana Neves, co-author and also from Exeter's Engineering department, added: "The key to this new technique is that the textile fibers are flexible, comfortable and light, while being durable enough to cope with the demands of modern life."